And if there is such a thing as a choshen tie, F., our gabbai, will have it on. On the one hand it seems sacrilegious to hang a tiny holy breastplate from your neck or ears, but on on the other, what better way to remember Aaron, who got to wear much nicer clothing than his brother? 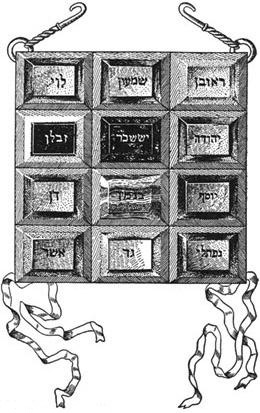 I would love to see a choshen design on a "kittel of decision" (rather than of eternal rest) for the hazzan to wear on Simhat Torah, a holiday when jewels of joy would make perfect accessories. Oh, your candlesticks are beautiful! Just wondering... my heart is set on getting a beautiful Star of David necklace someday... but I don't want to offend. It is very popular and perfectly good! (It's only tacky if the jewelry is tacky... ) There's a tradition called "hiddur mitzvah"--making a mitzvah as beautiful as possible, whether by wearing a gorgeous tallit, displaying exquisite candlesticks, or setting your Shabbat table with the finest silver. 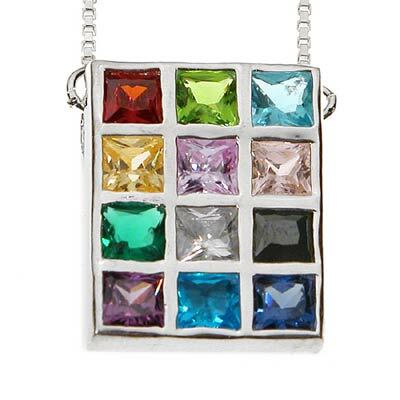 And jewelry falls into that category of enhancing and beautifying the observance of a mitzvah. Some people are more comfortable than others displaying visible signs of their religion--it really comes down to personal preference. There is a custom in Judaism of avoiding representational art, which could be mistaken for an idol (i.e., you won't see any statues of Moses)--but symbolic, abstract art is very popular. Some survivors are also uncomfortable wearing Stars of David because of Holocaust references. But in general--Stars of David, "chai" necklaces, even little "choshen" necklaces ( I may get one of those myself!) are wonderful.